Once an install is complete, many of our customers provide a review of their experience working with us. Their testimonials are listed here. We are always happy to provide references for you to contact as you research the process of going solar and review solar contractors in your area. If you would like to receive our list of references, please send us a message or call us at (360) 746-0859. I have been considering purchasing a solar system for about a year. I have received a lot of advice and recommendations from friends that are very happy with their decision to go solar. It sounded like a great idea, but I was a little unsure of the cost versus benefit. The Go Solar workshop gave me all the information that I needed to make that final commitment. The benefits far outweigh the cost, the financing was very simple and our community has a great program in place to support clean energy. Thank you. We enjoyed working with the entire crew and have told friends about Western Solar. Very pleased! My experience with Western Solar from initial contact, to site analysis to determine size and placement, payback projection and final installation was transparent, understandable and enjoyable. My sister-in-law referred me. I liked the installers and electrician a lot. They seemed to know their jobs well. Open and explained anything I asked. Western Solar was excellent to work with. They answered all my concerns promptly and the installers were very pleasant to be around. Working with Western Solar was exceptional from initial sales inquiry all the way through to project completion and system activation. They have provided us with a complete turn-key solution with superior customer service. Communication with all members of their team have been professional and timely with the attitude that the customer always comes first. I am very impressed with Western Solar and would highly recommend them to anyone considering a solar system. Just wanted to say thanks to Western Solar. It has been almost exactly one year since our system went online and we have had zero issues. Further, despite being a 26 panel system with slightly less than optimal angles and a complicated roof design Western Solar's prediction for how much the system would generate annually was within 1% of our actual generation for the past 365 days! If you've been on the fence about solar my advice is not to hesitate and give Western Solar a call. Working on a historic house, parts of which are over 125 years old, can create problems for securing panels. Western Solar spent the time and effort to complete the project, even a month early! So now the Tennant house overlooking Tennant Lake in Ferndale WA has Western Solar panels producing green power! Great Job! I am looking forward to the savings! I was referred by my neighbor. Josh and Eric were always available. The work was very fast and professional. The on-site technicians/workers were knowledgeable and great to work with. We would hire this contractor again, especially the electrician Eric! Thanks for making this happen in such a tight timeframe! We appreciate your hard work. Work began two days earlier than scheduled! We were very happy! Very good daily communication about the project.This was a more completed solar installation with multiple parties to interface with. There were a number of issues that arose during the construction which were quickly and completely resolved to my complete satisfaction. Good job all around. Work was completed on schedule and in a professional manner. The electrical inspector stated that Western Solar was one of the best solar companies in Northwest Washingon. The overall experience from initial contact through project completion was enjoyable! Very happy with all aspects of the project from inception to completion. Any questions I had were answered quickly and satisfactory. Quick install, nice, neat and they cleaned up after themselves. 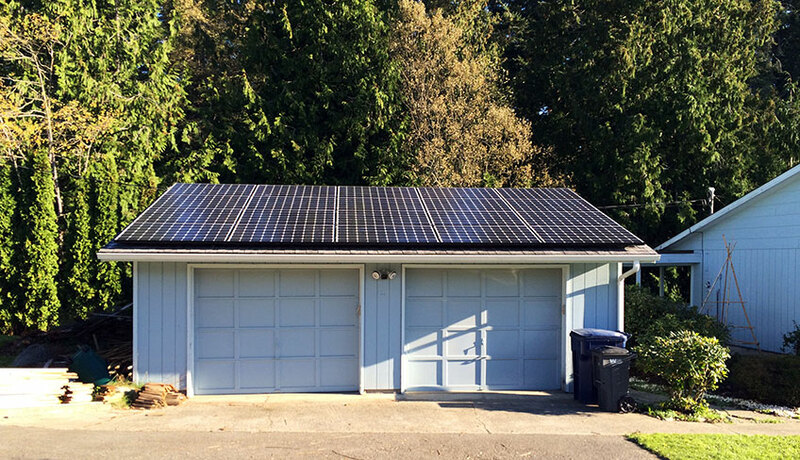 We had only dreamed of having a solar system for our house until we learned about the federal and Washington state financial incentives that reduced our payback time for this investments from 20 to 5 years! Josh and the folks at Western Solar couldn’t have been more helpful and friendly and the installation was fast and smooth. We are the stars of our neighborhood! Adding solar panels to our house is a financially sound investment opportunity that offer a better than average rate of return for the life of the panels, is environmentally correct, adds value to our house, and is a feel-good thing to do. What more can you want? Great job! Great communication! Western Solar made the entire process from information to presentation to power on, easy! We had an outstanding job done by the team from Western Solar, from start to finish everyone involved exceeded our expectations. The quality of craftsmanship was superior. I’m sure that we will call on them again when we expand our solar system in the future. Western Solar staff was a pleasure to deal with in all aspects of this project. I think they have a good product along with excellent personnel and customer support. When researching solar system for the house we interviewed five solar energy companies. We did an immense amount of research, and while all the companies gave us bids that were similar, Western was the only company that took the time to go on the roof with a small machine that mapped out the best position for the panels, whether they would be shaded anytime during the day and how much power they should produce to give us the best prediction of what to expect. This gave us comfort to know that we were only putting panels on our roof that would generate the maximum amount of electricity and so far they are right on target. I am very happy to have finally realized a lifelong goal to be a ‘producer’ rather than just a consumer of electricity. I like my system for the way it makes me feel on a sunny day. And on not so sunny days also! We are the envy of our local environmental discussion group for following through on ‘going solar’. Your entire team made this project a dream come true for us. The planet and the Palmers thank you!